GRUNGE ART - Rorschach Pop Art with a Schmear? With my artistic bent towards pop art and pop culture I always taken note of how the world of advertising and marketing bring fringe movements to the mass media of billboards, TV ads and product hawking. It has always fascinated me that underground movements that wish to defy the commercialization of the modern world end up as such a large part of that world sooner or later. The marketing machine of modern times is a hungry, voracious carnivore always on the ready to gobble up the latest "hot trend" and poop it back out to aid their product sales. This has always been somewhat humorous to me which is why most of my pop art has a decidedly light, silly and colorful feel to it - I think laughter is a much better weapon to deflate pomposity than anger. 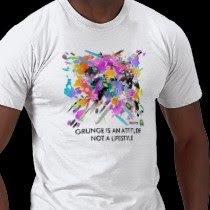 In the past year or so I've been seeing a lot of the Grunge influence popping up in ads and marketing. 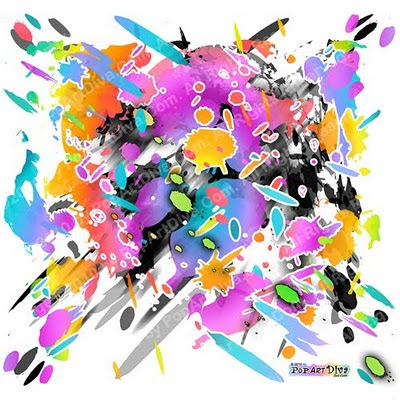 Cars, clothing and a ton of other brands/products are all getting a bit messy with the splatters, splats, drips and uncontrolled element that are big part of the grunge look. Whenever I see a new visual trend in mass media I get my "pop art" radar up and start doing some digging around to find the inspiration. In this case it was the Grunge movement that started in the mid eighties in Seattle, Washington. There's some lively discussion as to what constitutes "grunge art" but messy and dark seem to be the two common elements. Remember that this art is inspired by the Grunge music scene that started in Seattle - a music that merges the punk/hard rock sounds of the preceding era with the apathy and angst of the youth of the 80s. Most people will think Nirvana and Pearl Jam, though both these groups were a more commercialized interpretation of the original Indie garage music beginnings. There was a lot of distortion to the instruments in grunge music, especially the guitar, kind of a "messy" style of music filled with dark emotions (angst) and characterized by "grungy" looking band members. (The term grungy itself originated sometime in the mid sixties as an alternate term for dirty or filthy and to this day I still use the term for something dirty and sticky - i.e. "my kitchen floor is so grungy my feet are sticking to the tile!") Thus angst, boredom, dishevelment and distorted sound combine to create Grunge and Grunge art is a visual of these same qualities. Twenty five years or so later Madison Avenue gets a hold of it and turns it into a sales aid - then I have to get a hold of that and turn it into a visual prank! Behold! My take on the Grunge trend of today's popular culture - a Pop Art of a graffiti Rorschach test on acid. And yes, being a former Mad Woman, I turned it into products too - that's just what I do. Since I just finished my Pop Art Burger and Fries I thought you would all get a kick out of seeing the real Andy Warhol eat a hamburger! I've watched this several times trying to see what brand of burger he's eating and can't - but I can see that the bottle of ketchup is Heinz, lol. This is Pop Art Food Performance Art! Maybe I should start recording my forays to fast food joints, lol. I could do 15 minutes on french fries alone! Image Copyright 2010 by PopArtDiva.Com. All Rights Reserved. Image ©2010 by PopArtDiva.Com. All Rights Reserved. No permission is given to copy, share, distribute, reproduce, post or print without written authorization. Contact PopArtDiva.Com for licensing information. The hamburger was a lot of fun to sketch and I drew it like I like to eat my burgers - with lettuce, onions, tomatoes and pickles and a lot of ketchup. I am not a 'mustard on hamburger' kind of person - mustard is for hot dogs! When I got to the color stage I found it a bit of a challenge because I was not too sure about odd colored beef but I liked the purple pickles, pink lettuce and blue tomatoes idea. In the end, I decided to leave the burger and bun naturally colored and just adjust the condiments and the fries. Pop Art is all about messing with cultural icons - taking the common of the day and turning it into "art" using commercial art techniques so, if Andy Warhol can turn Marilyn green, I can certainly turn a pickle purple and some lettuce pink! I always ask for extra pickles on the side because I just like pickles so you will see my side order of pickles on the right! If you look very close you will actually see the salt on the fries though probably not in the small image above. 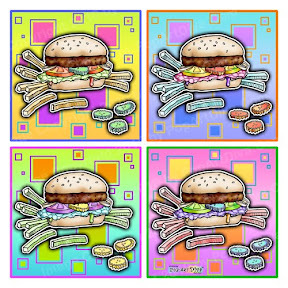 You can order up your Pop Art Burger and Fries on Posters, T-shirts, Aprons, Cards, Business Cards and other goodies at The PopArtDiva Gift Gallery. I grew up in Wichita, Kansas which just happens to be the birthplace of White Castle Burgers. Interestingly enough I never had a White Castle Burger until I was in my twenties and went back East for an ad job, but I do remember my folks taking us to Griff's. In those days a burger was fifteen cents and fries were eleven cents. Mom would order each of us kids a small burger, fries and a milkshake. I always got my burger with just ketchup and pickles (you could custom order your burger, at least in those days) and I got a chocolate shake. I would dip my fries in the chocolate shake - something I will still do if I get the opportunity. Griff's was one of the burger joints that had car hop service so we kids were often in our pajamas eating our burgers. I guess our folks liked the idea of just being able to drop us into our beds in a carb coma after dinner, lol. I just thought it was cool to go out to eat in my pajamas that had feet! The Griff's company closed decades ago but there are still some of the individual drive-ups open and operating in a few states. Had I known there was one in Albuquerque I would have hunted it down and ordered my old favorites just for the nostalgia. I can still remember that particular grease taste and those lard fried potatoes - honestly, nothing beats a french fry cooked in lard! I'm making myself hungry again. POP ART COOKIES - Cookies that won't go to your hips! Cookies that will NOT go to your hips! Put some POP in your kitchen or wardrobe! When I was working on my newest pieces in my Pop Art Food Series (Pop Art Cakes, Pop Art Pies) I did a quick cookie sketch too but it was not my favorite of the three and I almost didn't do this Pop Art! I mean how much can you do with a stack of cookies?? Interestingly enough, my POP ART COOKIES turned out to be my favorite. I think it's because I love the kind of retro background I created for this one. There's something about those circles that just really pop the cookies. Plus it was fun making the chocolate chips in a rainbow. I may use this background idea for my Pop Art Hamburgers, Hot Dogs & Fries too. It's got that retro drive-in feel to it. 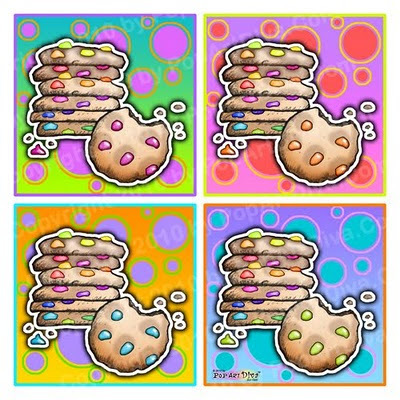 I'm having a great time with this series of Pop Art Food - every one of these remind me of being a kid and eagerly anticipating one of my Mom's homemade desserts. I still love her cherry pie better than any other I've ever tasted and her Gingersnaps are my all time favorite cookie. It's nice when my own art brings me these kind of wonderful memories. They also make me hungry and I ended up making a batch of chocolate chip cookies yesterday - yes, I used M&M's instead of chips, had to have my rainbow colors! Have a great 4th of July Weekend! Be sure to check my Twitter today - I'm tweeting cookie quotes, facts & recipes all day! 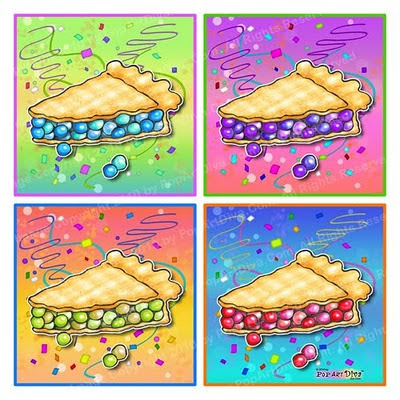 POP ART PIES! Pop Art Food that's Low Calorie! on Posters, T-Shirts, Aprons, Cups, Cards, Business Cards, Ties & More! Like I said in my last post, I have wanted to do a series of Pop Art Food for ages. I finally got around to starting the series and did some Pop Art Cupcakes after visiting one of those hot, new cupcake bakeries for my birthday in January. With that kind of nostalgic inspiration I ended up doing a series of Ice Cream Martinis for my site, TheMartiniDiva.Com, then finally sat down and started my Pop Art Food series! 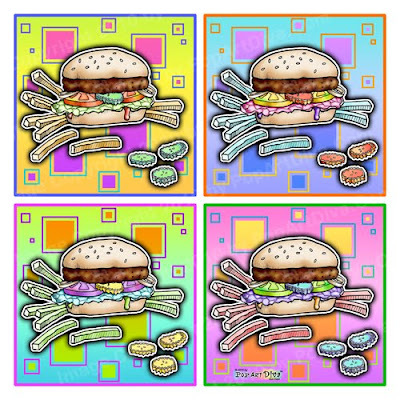 Yesterday I was grabbing a quick hamburger in a fast food joint and realized that it would also be fun to do Pop Art Hamburgers, Fries and Hot Dogs! Guess what my next pop art projects are? I always say I can Pop Art just about anything - I've done company logos, people and their pets of course, celebrities, cocktails, money, rubber duckies, even famous landmarks- you name it I've done a Pop Art of it or I will! HAPPY FOURTH OF JULY - No, I haven't done a Pop Art Flag yet - what was I thinking?? ?